Product prices and availability are accurate as of 2019-04-10 08:52:44 EDT and are subject to change. Any price and availability information displayed on http://www.amazon.com/ at the time of purchase will apply to the purchase of this product. 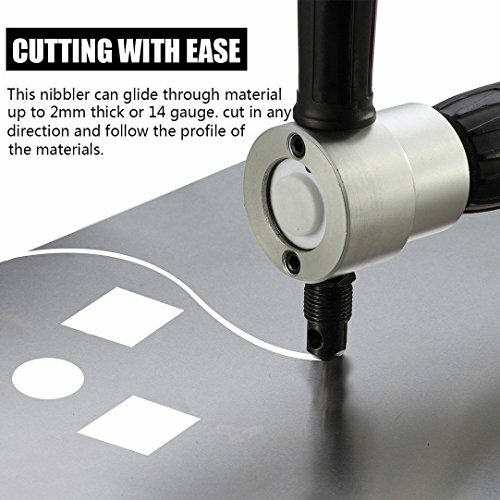 This double head sheet nibbler metal cutter suitable for car repair and maintenance and metal sheet productions. 1. Excellent cutting speed by 2 metre per minute with 1500 - 3000 RPM. 2. Excellent cutting effect without any burrs and edges. Capable of cutting any kind of thin metal and sheets. 3. 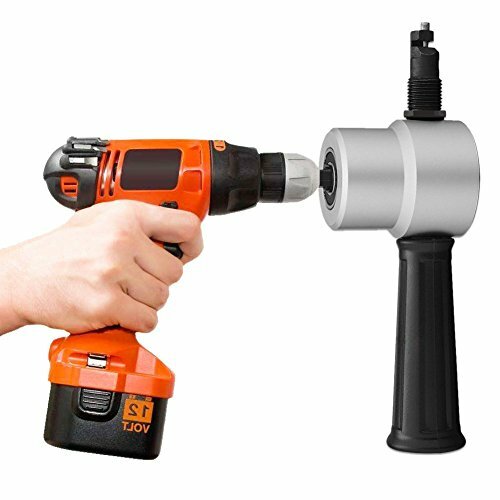 Double cutting heads 360 degree adjustable for easy cutting in any space. 4. 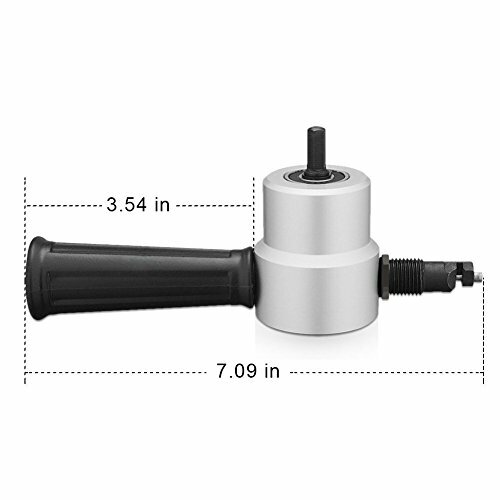 Metal sheet nibbler cutter is a drill attachment, need to be used with an electric drill or air drill. 5. Maximum cutting capacities: iron/steel plate 1.8mm, stainless steel plate 1.2mm, copper/aluminium plate 2mm, plastic/fibreglass board 2mm. Cutting Diameter: 7.4mm / 0.3"
Shank Diameter: 27mm / 1.06"
Make your cutting job easier, faster and safer with our double headed sheet metal nibbler, it can fitting effortlessly into any standard drill. 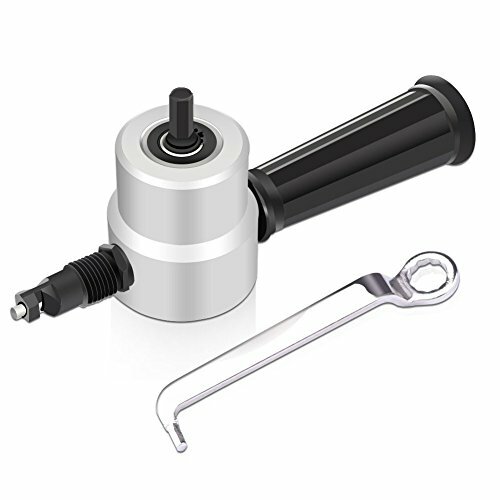 it can cut through material up to 2mm thick and creates a precision, burr free edge. Suitable sheet metal, corrugated material, pipes, complex profiles, powder coated material, stainless steel, copper, aluminium, formica, plastic, fibre glass. Even soft materials such as denim, leather, paper or card. Cut through metal like a hot knife through butter. You can cut in any direction and follow the profile of the material. Gutters, roof sections, complex shapes or stencils. You can also effortlessly cutting straight and beautifully circle. 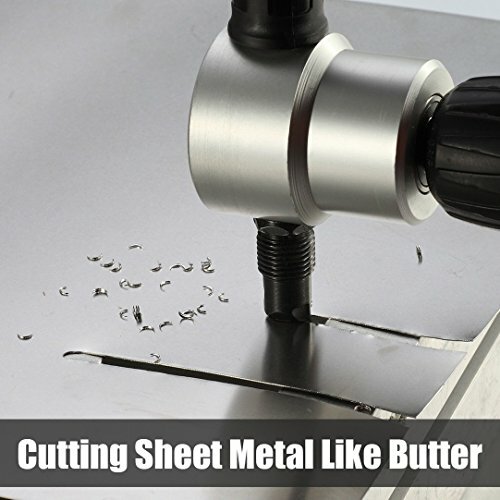 This is a powerful tool that will change the way you think about cutting sheet. That will save your time and effort at many cutting jobs. Best cutting result without any burrs at the cutting edges. Excellent cutting speed by 2 metre per minute with 3000 RPM. Perfect for car repair and house maintenance like metal roof cutting, HVAC vent pipe and other metal sheets.